We celebrated Nyepi here last Tuesday on February 16th. Nyepi is a Balinese holiday symbolizing the start of a New Year and is celebrated by a day of Silence across the entire island. Nyepi is the one day of the year that the entire island of Bali goes silent. Everything closes, the airport shuts down, no lights are used...total darkness and silence. The holiday is meant to serve as a day of self-reflection. Even if you are not Balinese, you still have to stay in your home with no activity or noise for 24 hours and respect the holiday and your surroundings. I didn't really know how Nyepi would be this year seeing how I have a newborn baby but it was actually really nice, relaxing and peaceful. A friend was out of town so we stayed at his house for Nyepi since he has an air conditioner and I just couldn't see staying at home with a newborn baby and no lights or air conditioner. 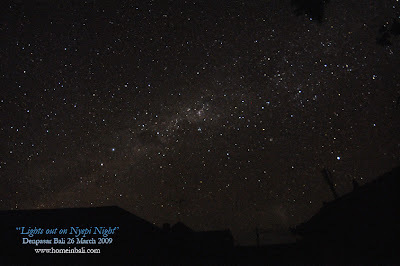 I did get to sneak outside around ten that night to glance up at the sky. It was simply breathtaking. The sky was completely free of any other lights besides the stars. In insuring to pack all baby's necessities, I forgot to take my Canon with us but below I have included a picture a friend took last year on Nyepi. Isn't the sky BEAUTIFUL? The photo above can be found HERE at Home in Bali's website. You can read more about Nyepi on Wikipedia.